The Swinepocalypse is upon us! 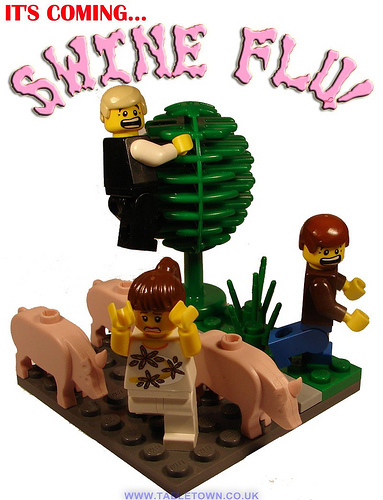 Andrew Summersgill (Doctor Sinister) has posted a very timely swine flu pandemic vignette that perfectly captures the mood in the news over the last few days. My favorite is CNN sent the whitest of white guys down to Mexico to talk to the nurses there. First, that seems really dumb, but the guy didn’t even speak a word of Spanish! dirty pigs and their darned cloven feet! This isn’t funny. My Mexican great uncle just died from the swine flu. OK, maybe it’s still a little funny. Brendan: I’ll assume that Andrew didn’t create this MOC to poke fun at the victims, but to symbolize the mass hysteria caused by the sudden small outbreak in the U.S.
Will is correct. Just to clarify, no offence is intended. I’m in the UK where we have about two cases of confirmed Swine Flu (and the sufferers are recovering very well) but all the media types are talking about is a global pandemic which could destroy the world. Good news doesn’t sell papers or get TV ratings it seems. This might help put things in perspective a bit ;) Great MOC Dr. S! ^ Good link Starwars4J. I feel the same way hearing about drug war deaths in Mexico when we have 10k or more of the same on a good year in the USA. Too political? I back off. Actual LOL when I saw this. Reassuring to know Dr. S manufactured this flu strain to create the Greater LEGO Co-Prosperity Sphere. On talk radio it was the callers’ political villains of choice. Way to arrange scapegoats in advance! ^Yeah, scapepigs. And no offense, but I like the “apigalypse” suggestion. BTW, just read TBB’s glossary just for fun. If all reference material was so silly it would be worth reading. I’m a bit surprised nobody has come up with this one yet: the “aporkalypse”. I just heard a new one – Hamthrax. But wait! There’s a cure… OINKMENT!